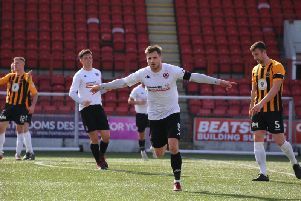 Arbroath picked up their first point of the season when they came from 2-0 down and grabbed a late equaliser at Shielfield on Saturday. Goals in the first 15 minutes from Darren Lavery and Michael McKenna put Berwick in the driving seat, but Andy Ryan oulled a goal back for the Red Lichties three minutes later, and just three minutes from the end of normal time Darren Ramsay earned the visitors their first point of the campaign with a close range equaliser. Berwick fielded an unchanged side from that which lost 4-1 away to Kilmarnock in the League Cup in midweek. Arbroath went into the match without a point from their opening three fixtures, and Rangers put them on the back foot straight from the off when Lavery powered in a header from a McKenna corner in the third minute. And it was 2-0 after 15 minutes when McKenna slotted the ball home confidently with a first time shot from a central position after Blair Henderson beat his man and squared the ball in from the right. But just three minutes later Arbroath hauled themselves back in contention when Andy Ryan produced a good finish to make it 2-1. Arbroath had the ball in the net again after 26 minutes with another neat finish from a cross on the left, but the effort was ruled out for offside. Both sides probed and tested the opposition defence, but at half-time it remained 2-1. Early in the second half Arbroath held the territorial advantage and Ramsay flashed a shot over from distance. But in truth the second half was drab by comparison to the first with chances at a premium at either end. Neither side seemed to be able to string passes together and the service to the front men on either side was very limited. Player manager Colin Cameron limped off when he felt a pull on his hamstring and was replaced by David Banjo, but he only lasted seven minutes before he too was forced to leave the field after complaining he felt his hamstring ‘pop’ after his foot rolled over the ball. Late in the game Henderson looked to be harshly hauled back for offside whilst substitute David Morris burst through but failed to finish. Rangers then found themselves defending too deep in the closing stages and in 87 minutes Ramsay popped up to net a late equaliser for the visitors when Martin Grehan headed a cross into his path. There was also still time for a shot to flash across the home goal from the Arbroath right, andunder the circumstances Berwick were probably just glad to hear the final,whistle. * Saturday’s game was sponsored by the Berwick Rangers’ Supporters’ Trust, who as part of the deal provided free admission to fans. Donations were taken at the gate and the game saw an increased crowd of 721.